Renegade Bowling Pins are on the loose! Knock them down using matching colored balls and create dynamic results powered by real-time physics. Collect bonuses, power-ups and utilize an arsenal of super-powered balls to knock back, freeze, and obliterate the pins! Solve unique puzzles and defeat dangerous bosses. With this much action packed into one game, "The Alley Strikes Back" will provide many hours of entertainment for players of all ages! 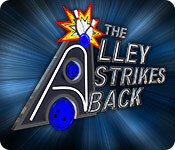 The Alley Strikes Back is rated 2.3 out of 5 by 11. Rated 3 out of 5 by p2668 from Not too bad.... I've played worse... As one reviewer said, I too was excited to see a bowling game. Only this was just a bit too boring after the hour was up. Not sure what the game would turn out to be, but I don't think it will be a buy for me. I kept running out of balls, and there was no indicator of how many balls you had left, so that wasn't very good. I sure wish they would come out with a good bowling game, though. It can't be that hard to develop one, and the few that BF offers are just ok, but not great. It would sure be different than all the match 3 and HO games that seem to be mostly out there. Rated 2 out of 5 by bf_gamer from Do not buy! I played a whopping 16 minutes into the trial and shut it off! I have never shut off a game after playing such a short time! It has nothing to do with actual bowling. Rated 2 out of 5 by steve_san from The 80's called and they want their music back I would describe this as a combination of bowling, match 3 and tetris. Bowling because there is a ball and pins, match 3 because you take out the matching pins together, and tetris because the pins gradually advance toward the foul line. Each ball has a color corresponding with the pins and can only take out pins of the same color. There are three different points on the lane where the ball can be launched and (I can't stress this enough) it is very important to quickly choose the one with the best angle to take out the most pins at once. Each game has at least two goals (i.e. number of balls used, minimum time to complete, number of "strikes" etc.). The first goal must be met to complete the level, while the other awards you extra points for purchasing things like better bowling balls. While playing you can earn special "bonuses" like a ball that takes out all the remaining pins of the color you choose, extra money, a small ball, and on and on. There are also challenges like bouncing pins, pins that parachute in, and a penalty for gutter balls. The music is right out of the 80's but the play is so fast paced you probably won't notice it. Arcade style games are not my style and this one does not have much going for it, but the play could be right up your alley nevertheless. Give it a try, you might just strike out - in a good way, that is. Rated 2 out of 5 by bep1 from Didn't care for it. This game isn't really like bowling, and it is very boring. Sometimes you have to throw around a hundred balls. Just didn't like it. Rated 2 out of 5 by SilverBranch from Great potential but missed the mark This game could have been great! I love bowling games and was very excited to try this one. The premise has a lot of room for an interesting and addictive popper game. However, the premise is where the excitement and fun stops here. I played the demo and found myself incredibly bored by as little as the 3rd level (levels are divided into lanes so it was only the 3rd lane). I knew that when I yawned twice, and kept impatiently counting down the pins I needed to get as if it were a chore, that it wasn't a game for me. It was repetitive with very few colors to pop. The challenges were not interesting enough. The tutorial is brief and gets you playing right away, but it left me wondering how I was getting certain scores some times when I knock down a bunch of pins and not the next time I knocked down a bunch of pins (like the strike score). The graphics and music are a but outdated in my opinion. Rated 2 out of 5 by gussusie from Bad Bowling!! I played about 10 minutes of this game; I couldn't get any further. Even though you are shooting the balls at the pins, there are several balls in a roll that won't hit the target. It's nothing you're doing wrong, it just happens to be that way. It is an extremely frustrating game. This is one of the few games I do not recommend! Rated 1 out of 5 by grandmacathy from Don't bother I like most games. Game playing, to me, involves engaging my mind ( and occ. my ability to quickly move around the game board) to achieve the goal. This game has none of the parts I look for in a game. There is pretty much no control over what pins the ball hits, tho you can position the ball in 3 different locations behind the foul line. 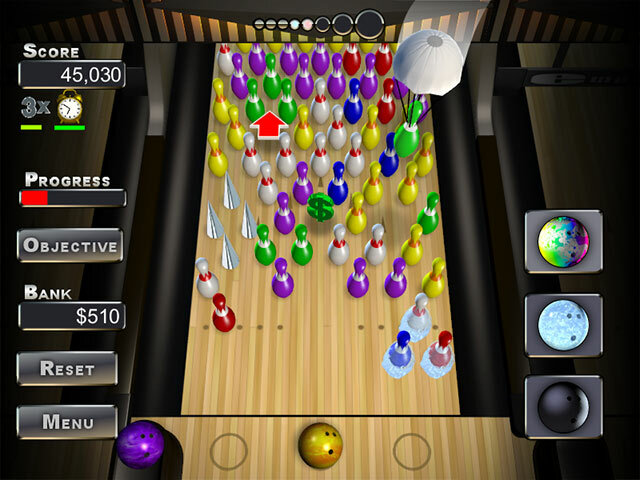 Each colored ball can only knock down pins of its own color, and you have no control over which color ball you have to use at any point in the game. So, if there is a red pin in the midst of many white pins and you have only red balls up, there is no way you can knock the red pin down because the red ball will not have any effect on the white pins, not even to move them out of the way. I got a few strikes but I couldn't tell you how that happened. 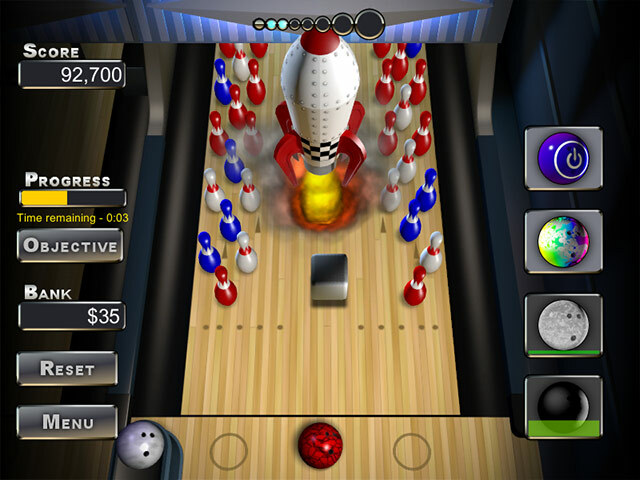 So the gist of the game is you release the ball and hope to knock down the pins you need for each level. It became very boring very quickly. Kids who are just learning how to play computer games wouldn't even like it! Graphics are minimal. There is so much more that could have been done in design of this game, and it looks like the developers just threw something together and hoped it would fly. I couldn't even finish the free demo. If the game was free, I would have to pass it by. I wouldn't waste the disk storage space. Renegade Bowling Pins are on the loose! 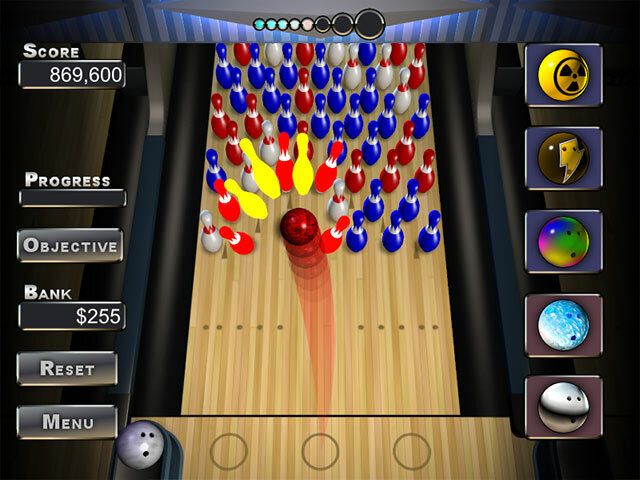 Smash groups of pins with super-powered bowling balls in this fast-paced arcade game!